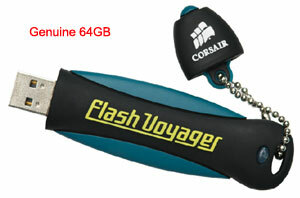 I recently bought a 64GB Corsair Flash Voyager from DealsDirect.com.au. I've got a couple of smaller Corsair ones already and I've been recommending the 16GB Voyager GT to people wanting a speedy thumbdrive, so when I got an email about a special deal 64GB one for about $100 AUD delivered, it seemed like a deal too good to miss. And maybe in hindsight, too good to be true. The drive had issues from the start - very slow and corrupting data. It also felt and looked slightly different to the other ones I own, and less well made. So I asked on the Corsair support forums what they thought about it. 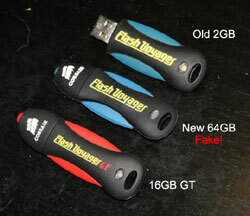 The official word: The 64 Gig in your picture is a counterfeit product. Seems I'm not the only one with an issue, either. So, what's the lesson here? 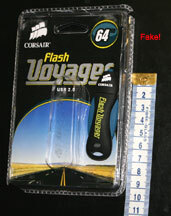 Well, we already know that fake memory cards are pretty widespread, but it seems even brand-name USB sticks can be impersonated, and a fairly reputable vendor can sometimes pick up a bad batch. But if your spidey sense is tingling, it's worth checking the manufacturer's website to see if the product on sale even exists in their lineup. I haven't heard back from DealsDirect as yet, but I'm sure there'll be no issue with a refund or replacement. They've already pulled the product page, but I'll be keen to hear how this all happened from their end.